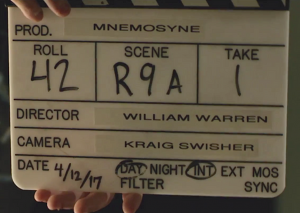 After a week of hard work and heavy lifting, Mnemosyne’s (Nee-mo-see-nee’s) second unit production has finally come to an end. While the four-day shoot was a long, anticipated reunion for most of the cast and crew, it also introduced several talented and outstanding newcomers to the team. Wrapping up well before sundown, enjoying catering from some of Atlanta’s best restaurants, and having a blast on set were just a few of the perks we experienced during last week’s shoot. Since wrapping on the principle shoot back in September 2016, everyone on our team has been in post-production mode. After several reviews of the first rough cut, our director and producer decided it was in the best interest of the film to write in additional scenes to better tell the film’s story which cued up the second unit production. In this second shooting we brought in a handful of new crew members, who contributed great energy and professionalism to the set. We were very excited to welcome the very talented Nia Peeples to the cast. Nia is known for her role in the hit show Pretty Little Liars, as well as for her roles in The Young and The Restless and Walker Texas Ranger. It was a wonderful opportunity having Nia involved in our production. She was a thrill to work with and brought the film’s powerful character, Claudia, to life. The challenge we faced in this part of the production was to recreate scenes that were originally shot at the camp in Townsend, Georgia, last September. Our goal was to avoid returning to the camp and to shoot everything in close proximity to our office in Tucker, Georgia. The closeness to our office actually proved to be somewhat of a miracle, since the collapse of the Interstate 85 bridge practically brought the city to a stand still just one week prior to the shoot. We scouted locations that fit the appearance we were looking for and used one of our favorite prop rental houses, Georgia Prop Source, to help make the appearance of those locations even more authentic. We had the pleasure of shooting at local businesses Twist ‘n’ Scoot and Blue Ribbon Grill, while utilizing some of our own office space as well. There was a tremendous spirit of teamwork on this production between departments, and everyone seemed to be in sync with the overall idea that we wanted to bring to life. From the dramatic lighting and camera work, to the set decoration and wardrobe, we recreated the world we experienced in Townsend on a low budget right here at home. As we move closer to Summer and closer to festival submission season, we will be working non stop to add in the new scenes, editing, color correcting, and scoring the new cut of the film. Throughout the next few months we’ll be releasing interviews with the cast and crew, more behind-the-scenes pictures, and promotional videos on our social media pages. Our goal is to submit Mnemosyne to prominent festivals and premiere the film in early 2018. We plan to launch the film for public release soon after the premiere. Stay tuned in the coming months, as you can expect a trailer for Mnemosyne as early as Fall 2017. In the meantime, follow us on Facebook, Twitter, Instagram, or IMDb to stay updated on other exciting news regarding the film!